Available exclusively at Walmart, Keurig K-Compact brings back the classic buttons and simple options while at the same time, saves space. It also comes at a sweet price at only $59.00. Combine the space-saving design of Keurig K15 and K250, with the simplicity and success of Keurig K55 (Elite) and you get K-compact. After not so successful Keurig 2.0 system Keurig decided to add another classic series brewer to their product line. I like the new design for one simple reason: Keurig kept all the things that worked nicely and skipped all those that were less successful. To name a few: Keurig 2.0 brewers often had problems with touchscreens, so they decided to go for simple controls and classic buttons. People loved the compact size of K15 (Mini) but hated that they had to add water and wait for the machine to heat the water before each cup. So, The K-Compact has a 36 ounces removable water reservoir which is large enough for making a few cups in a row. The K-compact is actually the most similar to one of their most successful classic models Keurig Elite (K55). It’s still one of the best Keurig coffee makers. It simply a space-saving version of this brewer. The K-Compact has basic options – 3 cup sizes (6, 8 and 10 ounces) and doesn’t have programmable features like temperature control or auto on. The only Keurig brewer offering these features at this moment is K-Elite. Here you can read my K-Elite review. While I do like its size and price, this machine does feel slightly cheap. Also, the unit I tested had a pretty strong plastic smell and the coffee tasted like plastic. So even if it’s super cheap compared to other Keurig models, if you want to make a good cup of coffee, I would rather recommend getting a $30 French press (and go plastic free). When you press the Power button, K compact takes approximately 4 minutes to preheat. This preheating is a one-time process. Once heated, you can brew cups one after another with small pauses. This is now called the Smart Start. To make the coffee, lift the handle, insert the k-cup and close. Choose your desired cup size (small 6 ounces, medium 8 ounces or large 10 ounces) and press the button. That’s it! On average, it needs 60 seconds to brew 8-ounce cup of coffee. When done, get out the empty k-cup and you can make a new one right away. The machine also has an Auto Off feature which turns the coffee maker off 2 hours after your last brew. Keurig K-Compact works with all types of regular k-cups: Keurig branded and non-branded, k-cups with updated or old labels. This is a classic model and it does not have a scanner. Keurig K-Compact reusable filter: Keurig K-compact works with new universal k-cup filter. As far as the cup sizes and features, K-Compact and Mini are almost the same. They can brew between 6 – 10 oz, work with all regular k-cups and they allow you to use your own coffee with a reusable cup. I do like the K-Compact more because it has a larger tank which can be removed and washed, and it has buttons for each cup size. The reservoir on Keurig Mini can’t be removed, and it needs to heat water for each cup, and you choose the cup size depending on how much water you pour into the tank. The K-Compact is easier to keep clean and it’s cheaper than the Mini. When we compare K-Compact with an upgraded Keurig Mini Plus, the Mini Plus look much better than K-Compact. But just like the old Mini, it also has a single cup reservoir, which means that it doesn’t have cup size buttons but you control the cup size depending on how much water you pour into the tank. The Mini Plus needs about 2 minutes to heat the water and about 1 minute for brewing. Keurig Mini Plus is also more expensive than K-Compact. What I like is that even though it has a single cup reservoir, the tank can be removed and washed. The K-Compact includes a limited one-year warranty for normal home use. Customer service help is available 7 days a week at 866-901-2739. Keurig K Compact cleaning: It’s recommended to clean the external parts or the brewer regularly using a wet cloth and descaling the machine every three to six months. Here’s how to descale Keurig Compact. Keurig K Compact water filter: Keurig K-Compact is compatible with rear reservoir filter kit. The filter should be changed every 2 months, or 60 tank refills. Keurig K-Compact instructions: Here you can download Keurig K-Compact manual. The Keurig K-Compact is available to purchase exclusively at Walmart for $59.00. 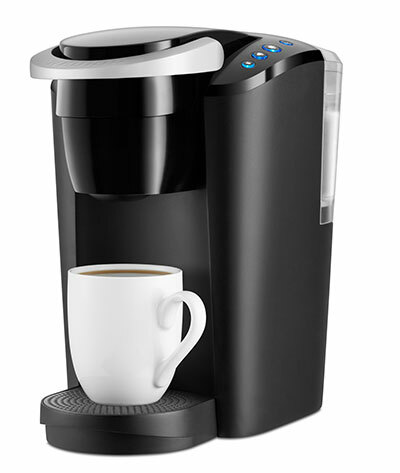 Its nice size and a sweet price are appealing and it’s a good choice if you really want a Keurig machine but don’t want to spend a ton of money on expensive models. However, if you’re looking to make a good tasting cup of coffee, a simple French press might be a wiser choice. Here’s some info that will hopefully help you find the best Keurig model for your home. Here’s what you need to know before buying a Keurig coffee maker. I don’t understand why you are knocking the k-Compact maker so much. Mine works perfectly. The coffee does not taste like plastic as you say. Therefore, I would recommend it! Hi Janice, thank you so much for the feedback, I’m so glad you’re happy with your machine. The unit that I tested had a strong plastic smell and the coffee tasted bad. Also, I got several emails from my readers complaining about the same thing. It’s just something I must mention in my review. Besides that, the brewer is nice especially since it’s similar to old Keurig Elite, it’s small, has simple controls but comes at a much better price. Thank you once again for your feedback, I’m sure others will find it very useful! I’m so glad you’re happy with your machine. PS. I have a few easy recipes you can make with your Keurig machine, I hope you like them. How can you review a coffee maker and not mention how does the coffee taste? Others have complained that it makes a week brew..did you find that to be the case too? Hi Paul, I actually mention that in my review, you just probably just missed it. The K-Compact does tend to have a slightly plastic taste and I don’t like it for that reason. Please let me know if you need anything else. I’m new to keurig and I love it. My cousin got me 1 for my birthday. It’s been 3 weeks now and the refill water light stopped working. What should I do? Hi Jesse, I don’t think that any of these solutions will work in this case. I recommend calling Keurig customer service at 866-901-2739 to help you troubleshoot your machine. Thank you. I bought one while on vacation. Love it! Planning to store it for next holiday. How can I drain the water out of the internal reservoir? Hi Cindy, unfortunately, the inner tank cannot be drained completely for storing. Keurig recommends storing your brewer in its upright position to avoid water leakage from the inner tank. Thanks for any light you can shed. It’s my first rodeo with a Keurig. Hi Cheryl, the k-compact has a 36-ounce reservoir which is enough for about 2-3 large cups. You can simply fill up to a max fill line and refill when needed, you don’t need to keep it at the max fill line all the time. For the best taste, I recommend refilling the reservoir with fresh water every morning. Can you tell me if the water is stored in an internal tank that you can’t drain like the larger models? I would like to purchase this model for my cabin where the temps are so low the water will freeze if I can not drain it completely before I leave it for the winter. Hi Beth, that’s correct, this model also needs to be stored in its upright position in a frost-free environment like other models. Awesome review! I’m not a coffee drinker, but I just bought one of these for my girlfriend today (she’s been talking about a Keurig forever). Trying to be a responsible buyer, I’ve been doing some research to make sure it’ll be good enough. NOWHERE else had I seen anyone talking directly about touch screen vs. tactile button input, as well as answering questions I had about old Keurig systems in regard to compatible cups. Thank you. I am so glad I could help Jon, thank you very much for your kind words! “This is my first Keurig. I wanted one for years, and my daughter & son-in-law came through this Christmas- LOVE THIS MACHINE”!